Despite the species could actually live even in lowlands, the enormous pressure exercised by men along the last two centuries, together with a significative consumption and fragmentation of natural territories, have confined the primary habitat of the marsican bear nearly entirely into mountain areas of Central Apennines, which are characterized by a lesser impact from human activities and greater availability of food. The beech wood is the most widespread forest ecotype in the Apennines, its coverage normally ranges from 900 mslm up to 1900 mslm and it often shows the primary species, the beech (Fagus sylvatica), together with relic species such as the yew (Taxus baccata), the holly (Ilex aquifolium) and, less frequently, the white spruce (Abies alba). Inside the beech wood bears and other large mammals can find a suitable refuge, especially on those mountain slopes and valleys that present a complex morphology with little or none accessibility to men. Beech’s fruit is called faggiola and constitutes a major food source for bears, in order to variate and integrate this diet bears also need to move further to coppices, crops and orchards in rural areas down in the valleys. At the same time, bears also move up to higher grasslands in search for roots and berries. One of their preferred berry is the smal black fruit of Rhamnus alpinus which constitutes a really important source of food at the end of summer, when bears need to amass fats before winter hybernation. Continuity and integrity of refuge areas, both forests and grasslands, is an essential aspect in conservation and diffusion of the species. 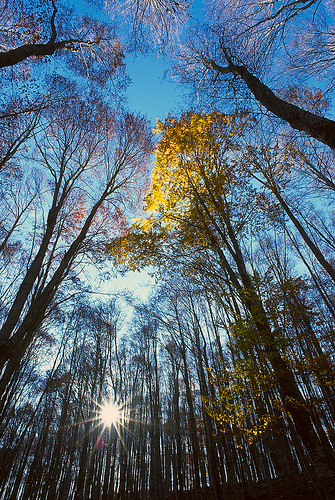 The largest montane forest of Central Apennines are currently under protection thanks to a system of parks and reserves, which guarantee their preservation and sustainable use. However, at a larger spatial scale a key point for bear conservation is the connection between protected areas: a network of undisturbed corridors is vital for the bear to cross the bottom of the valleys and the urban areas. Under a demographic and biogeographic point of view, the expansion of bear range and the reduction of human induced mortality are the most important factors to avoir bear extinction. Therefore, local autorities should encourage the creation, the maintenance and, if necessary, the restoration of large wooded corridors between parks. Today the Marsican brown bear is highly threaten with extinction. A population of just 35-50 bears is left, the most of them living in the National Park of Abruzzo, Lazio and Molise and in its External Protection Zone (ZPE), though sometimes a few lone individuals are signalled in other areas, contiguous or not, where bears historically lived (Majella, Sirente-Velino, Duchessa mountains, Carseolani mountains, Ernici mountains, Terminillo, Gran Sasso-Laga mountains, Sibillini). Generally they are young he-bears in dispersion which, unfortunately, cannot find any female for mating in the new-reached-places, since another characteristic of this species is that females tend to live in smaller home range and stay closer to their birth places.